Today I'm making over a recipe that was already a bit of a makeover. 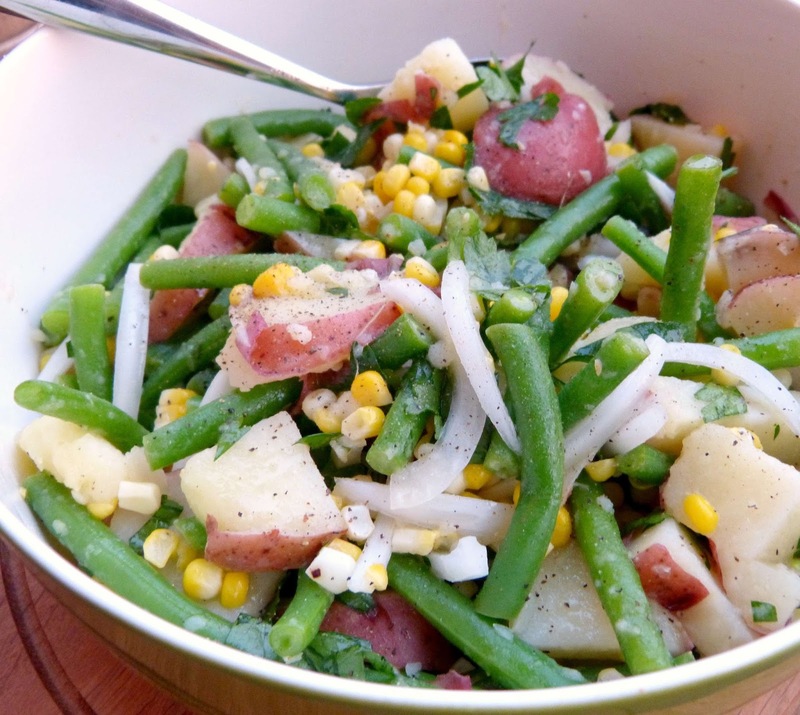 A few years ago I posted a recipe for potato and green bean salad. Side note: it's crazy that I am say I wrote a blog post "a few years ago." Time flies. Anyway, that potato and green bean salad was a twist on one of my all time favorite dishes: my Oma's German-style potato salad. This simple side dish usually consists of boiled potatoes, crisp onion, fresh parsley, and a simple vinaigrette. I added crunchy green beans and spicy Dijon mustard in my last iteration and loved the fresh and flavorful result. This time around when I decided to make this salad I also had some fresh corn in my fridge. Corn is one of those foods that just tastes like summer and any corn that you get in any other season just doesn't compare. It's so sweet and juicy at this time of year that I figured it would be an excellent addition to this salad. Some fresh corn and sweet summer basil are simple additions that make this salad taste totally new. The original version of this potato salad was served at almost every family gathering that I can remember my Oma hosting when I was a kid. And if it wasn't on the table, then mashed potatoes were! I especially remember it in the summer served alongside grilled barbecued chicken at her backyard picnic table. And my new version makes an equally delicious summer barbecue side dish! Whether you're serving a crowd or you're just doing some simple grilled chicken at home on a weeknight, this salad is a healthy and flavorful side for anything hot off the grill! Separately, bring another pot of water to boil. Add the green beans and cook for 3-4 minutes until the beans turn bright green, but are still crispy. During the last 1 minute, add corn to the pot. Boil and drain the green beans in a colander and rinse with very cold or ice water. In a large bowl, whisk together vinegar and Dijon mustard. Slowly stir in the oil while whisking and season with pepper and salt. 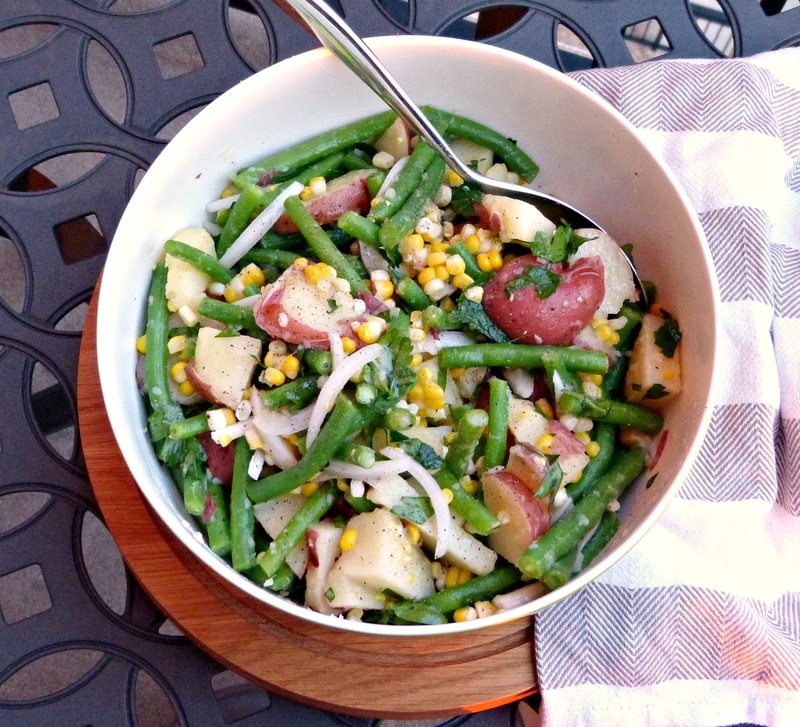 Add sliced potatoes, cooled green beans and corn, sliced red onion, parsley, and basil to the bowl and toss gently to coat. Add any additional salt or pepper to taste.